Perhaps you've been congratulating yourself on having less than $200,000 in student loan debt, telling yourself your own student loans aren't so bad. Well, stop that! The 2010s are the decade of "Feeling Bad About Your Student Loans." What Happened to That Girl With $200K in Student Loans? Moody's has issued a new report on the student lending industry. It makes for quite illuminating reading, provided you are in no way invested in the student lending industry! We here at Gawker.com are not technically "fully accredited economic analysts," but this sounds pretty clear to me: "Based on CPI data, the cost of tuition and fees has more than doubled since 2000, outstripping the inflation rate across all goods, as well as the growth rates of energy, housing and healthcare costs. 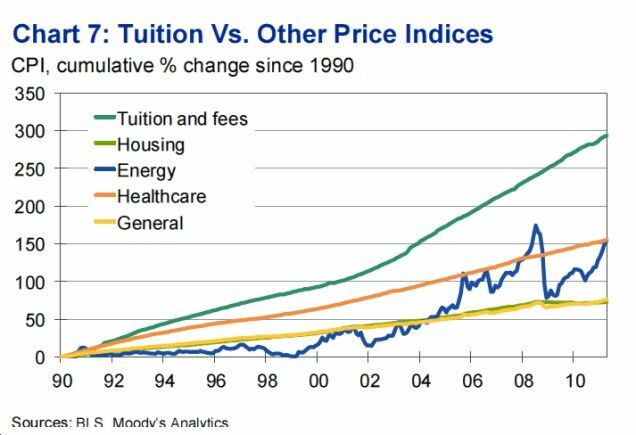 Despite all of the attention that house prices receive, it is noteworthy that even during the housing bubble, real estate appreciation was far exceeded by the growth rate in tuition. Fears of a bubble in educational spending are not without merit." The report also points out that colleges are steering students towards ever larger private loans, and that, since demand for education actually rises during bad economic times, we're now smack dab in dynamic consisting of more people taking out more loans for school that will not provide them with a job that will enable them to pay back those loans, leading to higher loan defaults and, ultimately, the risk of a collapsing bubble—which, in this case, would be bad not only for the normal economic reasons, but also because it would discourage enrollment in higher education over the long term, giving America a less educated work force over the coming decades. Or maybe that's what we need? We're not doing so well with what we've got right now.